Sergiev Posad, a small town 75 km north of Moscow, is generally described in English, first and foremost, as ‘a great day trip from Moscow’. While the distance indeed means that at least geographically the place seems destined to get some tourist attention, the Russians know it as something else. For them it is a place of pilgrimage. The overwhelming atmosphere in the kremlin especially is of a deep religious belief, eminence piousness, and quiet devotion. Gate through which you enter, from the inside. The pattern is painted on. Before we go any further- yes, I did just write kremlin. A kremlin is actually the central, fortified area in any town, not just the government centre in Moscow. Also, even though my spell checker is going crazy, in this case, it is spelled with a lower case ‘k’- in order to distinguish them, only the Moscow Kremlin is capitalized. 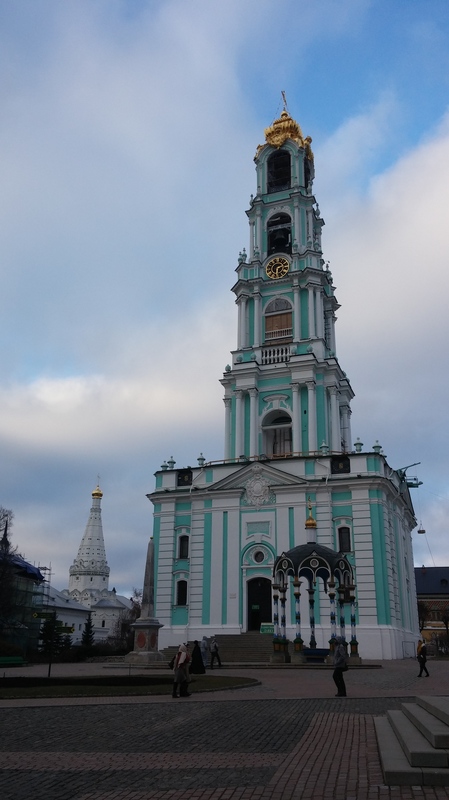 So yes, the central ‘attractions’ of Sergiev Possad lie within the kremlin walls, the fortifications protect several churches, the grave of Boris Gudonov, (the one who spent quite some time at the New Maiden’s Convent), a holy spring, and a tall, tall clock-tower. However, as soon as you approach the kremlin, the relationship that the Russians have with this holy place becomes apparent. The people around you cross themselves before entering, muttering prayers, and covering their heads with scarves to show respect. Enter through the Gate Church St. John the Baptist, intricately painted with murals and patterns primarily of the life of St. Sergius, carefully maintained. Once within the walls, the classic-stereotype of Russian onion-domes are looming above you, catch your eyes. On display are not just standard gold, however- especially striking is the church with its blue domes, covered in gold stars- this is the Cathedral of the Assumption. Much like the church of the same name in the Kremlin, this building has a high ceiling and every centimetre of wall is painted with religious images. Commissioned by Tsar Ivan the Terrible, guidebook has it, that he ordered it built in part to atone for his murder of his own son in a fit of uncontrollable rage. 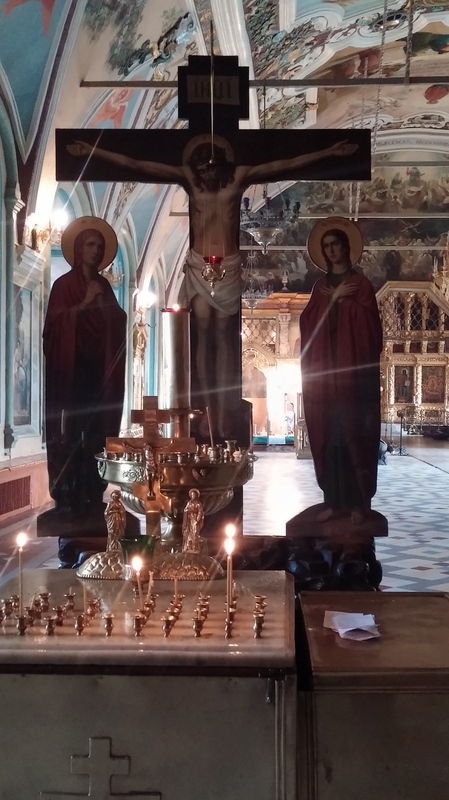 Also a real palace of faith is the Refectory and Church of St. Sergius. Architecturally the outside is fairly simple, decorated, and given visual depth through patterns painted on it. Inside, all illusion of simplicity disappears. 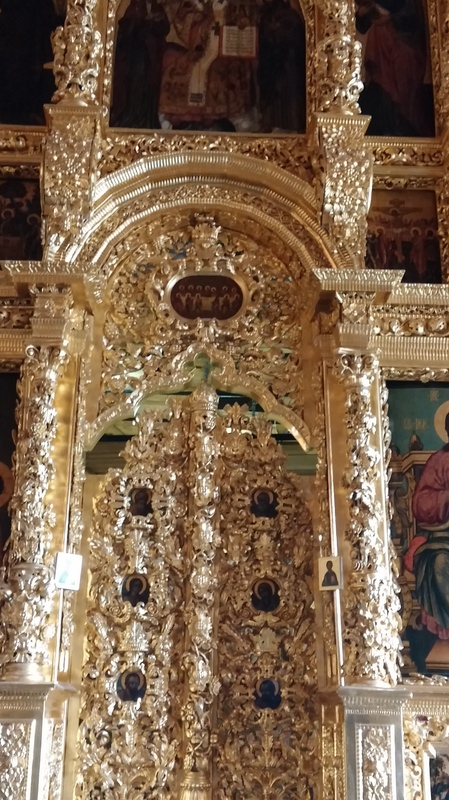 Gold dominates the scene, religious figures crowned, framed and decorated with gold paint. The intricacy is simply stunning. We were also lucky enough to get a glimpse of an actual ceremony in the Cathedral of the Holy Trinity. In a far smaller space than the other two churches, with a strong smell of candles and incense, we witnessed beautiful chanting speech and song, and a procession of believers paying their respect. It was atmospheric and very unusual for me to see people which still have such profound faith, and show it not only through joint prayer, but also through the physical movements of bowing, kissing symbols, and pressing their foreheads against them. This is an entirely different feeling one gets from the tourist dominated churches in the Kremlin and the vast Cathedral of Christ the Saviour. It feels somehow more authentic, although many of the other sights, shops and services in the town have clearly developed under the influence of tourism. It was very welcome, to be away from multi-story concrete buildings and in fresher air, to marvel at the wooden buildings and perhaps more classic architectural style. 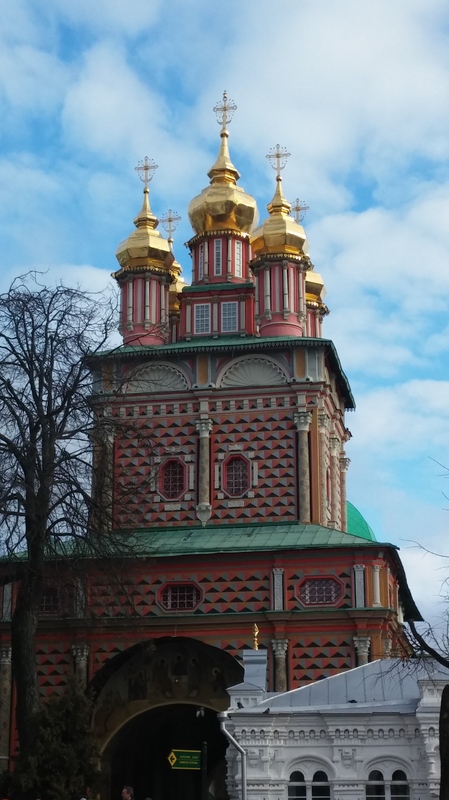 This is part one of two of my thoughts and comments on Sergiev Posad. Once published, find my other post here. Beautiful photos. Can’t wait to visit Russia one day! You should! It’s a very interesting and beautiful place!